Vibrations, or frequencies, can be found affecting everything outside and inside us. A stone creating ripples in a pond, microwaves and WiFi, a snowflake, any sound, light, color, and shape, resonates a specific vibration! Different frequencies have different properties. Biologic architecture uses the properties of the frequency of shape (as seen in cymatics) and properties of materials (paramagnetics and dielectrics) used to design a life-enhancing building, as experienced in sacred spaces like cathedrals. Nature shows that the energy produced by an egg shape made of eggshell (calcium carbonate (limestone)) is helps the growth of living things. We can produce this same energy in our homes. This is the physics of feng shui, and it affects more than your living room. On route to the biodome build in South Africa, a synchronistic 13 hour layover in Paris led to the Notre Dame Cathedral. It is one of the prime examples of biologic architecture in the world. In the aisle seat, close to the center point of the room, the chilling goosebumps felt throughout the body during the organ concerto is the biofeedback that lets one know and feel the secrets of path of the great work. As above so below: the body is the internal temple, and the external temple needs to benefit the body. This is basis our workshop at www.Bioveda.ru headquarters, with the help of www.Ubuntuplanet.org / www.OneSmallTown.org in South Africa over a two week period in mid February 2018. We are building a home that is completely symbiotic and integrated with nature. 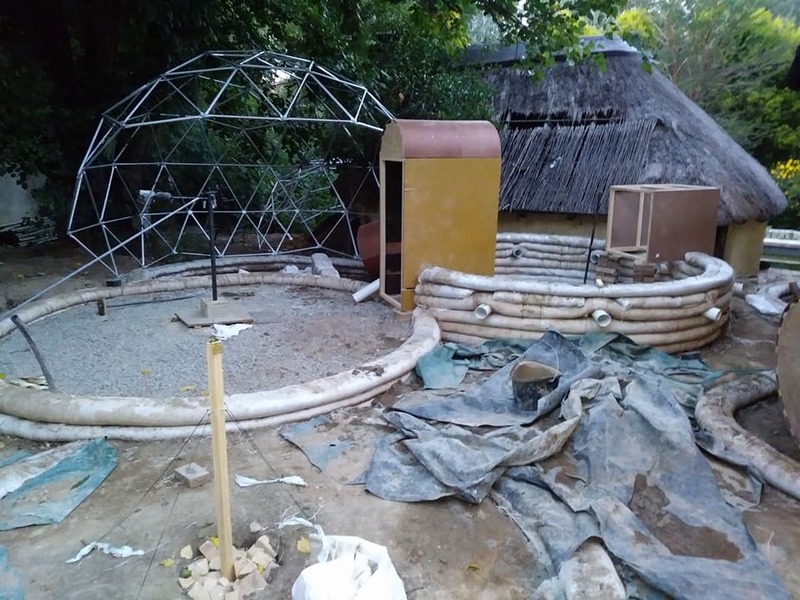 This home, called a biodome, is based on the phi ratio, egg shape, and is made from sandbags and aircrete (ideally the material used would be hempcrete). This shape and material will allow the energy of feng shui to be produced. One will feel relaxed in and around the house. This energy will also enhance the health of surrounding soil, living organisms, and groundwater. The home is self reliant and automated, meaning that the water, food, waste, and energy needs are all being produced and regulated by the home itself. Alll the owner(s) have to do is build and maintain it. In the Ubuntu/ one small town initiative, they have partnered with Langenburg Technologies for a solution for treating all waste, purifying and energizing water, and producing all electricity off the grid. The community grows thier own food, and all the basic necessities will be taken care of. Only then will real progress and evolution be allowed to occur. Day 0 of the biodome build, us 15 students are shown around the curator Alosha’s house. He is in the process of turning it into this self reliant biohome. He explains how the water system works. Water collected is filtered, charged and imploded to make living structured water. This living water is the same vibrational physics as bio architecture, and is explained by Dr Gerald Pollack in his recent book “The Fourth Phase of Water”. The water is stored in eggshaped tanks. The sewage water and grease trap are fed under the soil and wetland for permaculture garden. The property runs all on solar power, with a backup generator just in case. All these are explained in detail in the online courses at www.bioveda.ru . In back of the main house, which is planned to become a bio-architecture/ permaculture school, is the building site for the biodome. The underground water reservoir and sandbag foundation is already laid out, so we will be makinng the aircrete to form the structure, starting the next morning. Tonight, we eat dinner and share introductions and goals. Our collective vision is to get this knowledge and practice communicated to every person of any age, anywhere in the world thru education. Self reliant, automated community living. Once we have the shelter water, food, and power, then we can do “bliss practices” such as music and dancing, energy exercises like meditation and yoga, taichi and tantra, imagination and invention- with the end goal of growing our spirit/ soul/ aura/ life force. All of this is facilitated by the life/love energy producing bioshelter, biodynamic food, and living water. This is the basics of living, so we need to perfect and master this foundation first before we move onto what's next. It takes about a week for us to perfect the aircrete mix (hempcrete is a better material that will be used in all future builds). This superadobe “ecodome” building method was originally designed by Nader Khalili. “His sustainable solutions to human shelter have been published by NASA, and awarded by the United Nations, and the Aga Khan award for Architecture, among others” (1). Our workshop curator learned this method from Khalili’s institute at www.CalEarth.org . The method consists of material filled superadobe bags placed in a circle. Barbed wire is weaved onto the bags to form a tensile ring for optimal structural strength. At a certain height, the next bags are placed slightly inside the previous bag, eventually forming the egg shaped dome. A small opening at the top of the form is capped with a fabricated form with pent or hex geometry. Pent (5) shape works well for distribution of energy- like growing and ripening of food. Hex (6) shape works well for isolation of energy- like for storage of food (look at beehive). One isn't better than the other, but knowing how and when to use each shape is essential for optimized living. Feng shui/biologic architecture/ living water is more scientifically called longitudinal interferometry (in depth study of this at www.goldenmean.info/architecture. It’s the science of longitudinal (pressure/pump/chi) waves (EMF or water waves) interfering with each other. When these waves are able to interfere constructively (focused), a standing wave is produced.This gives the relaxed, life growing feeling used in feng shui. Imagine a spine (or a hose, or a house) as a standing wave that can infinitely compress without any kinks. It’d never have pain or inflammation because the stress of gravitational force will always have someplace to go. The superadobe biodome room was completed. It was a valuable educational experience all the students are eternally grateful for. We all now have the hands on skills to build a dome structure ourselves. We look forword to life in self reliant biohomes, and the exponential increase of abundance in our communities from this new science of biologic architecture, vibrationally enhanced water, soil, food, energy, and activities that all will enjoy.